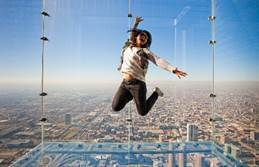 This Saturday and Sunday, Skydeck Chicago will be opening one hour early, at 8am, to allow visitors and local Chicagoans ample time to experience the spectacular views of up to 50 miles and four states from atop Willis Tower. For those looking for a standout Instagram photo, The Ledge is sure to impress. At 1,353 feet up, The Ledge’s glass boxes extend out 4.3 feet from the skyscraper’s Skydeck on the 103rd floor. Skydeck Chicago attracts more than 1.7 million visitors annually; it’s an ideal family activity for those looking for a fun outing this holiday weekend. Tipsy Robot, the galaxy’s first land-based robotic bar, will open its doors to the public on June 30 at 10 a.m., inside the Miracle Mile Shops at Planet Hollywood Resort & Casino. 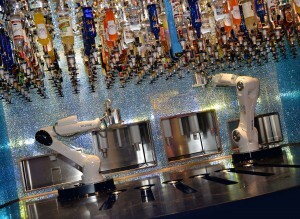 A one-of-a-kind destination attraction that merges craftsmanship and high-tech innovation, Tipsy Robot features two cocktail-shaking robots that interact with customers in a social, digital environment. 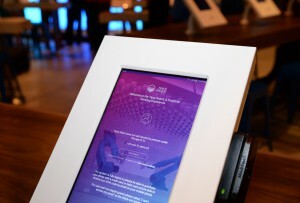 Customers can order one of Tipsy Robot’s 18 signature cocktails — or create a custom cocktail — through one of the bar’s 33 tablets. The robots mirror the actions of human bartenders. They mix, shake, pour, slice fruit and even dance to the latest Top 40 and EDM hits. Each beverage takes 60-90 seconds (or less) from order to completion. Robot bartenders won’t be running the entire Tipsy Robot operation. There is a human bar staff and “Galactic Ambassadors,” who assist customers with the drink-ordering process. The bar will also feature a live social media wall and photo booth for customers to share their out-of-this-world experience with friends and family. Tipsy Robot will be open 10 a.m. to 11 p.m. Sunday-Thursday and 10 a.m. to midnight Friday-Saturday. To commemorate the grand opening, Tipsy Robot held a special media/VIP event on Thursday, June 29, where the robots were officially unveiled for the first time. The robots do not yet have names, because Tipsy Robot wants YOU to choose. Stay tuned for the Robot Naming Contest. And, no, the robot bartenders do not accept tips (only toasts). For more information about Tipsy Robot, visit www.thetipsyrobot.com or follow them on Facebook, Instagram and Twitter. Tipsy Robot is the world’s first land-based robotic bar that employs two cocktail shaking robots, serving up drinks and dance moves. Offering signature robotic cocktails as well as custom options, the space allows guests to interact with the robots through the platform and watch the twin robots shake, stir, strain, muddle and pour drinks in a highly social, digital environment. Located on the “50-Yard Line” of the Las Vegas Strip, Tipsy Robot is inside Miracle Mile Shops at Planet Hollywood Resort & Casino. The bar features impressive human staff known as “Galactic Ambassadors,” a high-tech atmosphere and design, dynamic light show element at its entrance and phone charging ports set next to each drink ordering station. 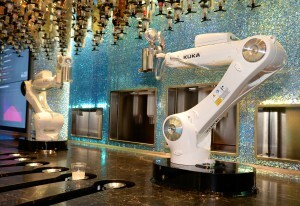 Tipsy Robot is one of the most technologically advanced bars in the world. Follow Tipsy Robot on Facebook, Instagram and Twitter or visit www.thetipsyrobot.com. Miracle Mile Shops at Planet Hollywood Resort & Casino features more than a mile of 200 shops, tempting restaurants and live entertainment venues at the heart of the famed Las Vegas Strip. The center is home to M·A·C Cosmetics, a leading brand of professional cosmetics; Sephora; premier blow out salon, Drybar; the second U.S. location of House of CB, a London-based retailer with a large celebrity clientele; H&M; GUESS; Flight 23 at Footaction, one of only three in the country; PBR Rock Bar & Grill, boasting a Strip-side location with excellent food, drinks and bull riding; Buffalo Wild Wings; Chicago popcorn legend Garrett Popcorn Shops’ only Las Vegas location; Nacho Daddy, home of the world-famous Scorpion Shot; 15,000-square-foot bar and restaurant Cabo Wabo® Cantina; Las Vegas’ very own Sin City Brewing Co.; Club Tattoo, featuring some of the best tattoo artists and body piercers in the nation; as well as a multi-million dollar fountain show. Miracle Mile Shops is an affiliate of Institutional Mall Investors LLC, a co-investment venture owned by Miller Capital Advisory, Inc. and CalPERS. Miracle Mile Shops is open 10 a.m. – 11 p.m. Sunday – Thursday and 10 a.m. – midnight Friday – Saturday. For more information, call (888) 800-8284 or visit www.miraclemileshopslv.com. Keep up with the latest Miracle Mile Shops news via Facebook, Twitter, Instagram and YouTube. Celebrate the Great American Eclipse! June Space-related Activities in Washington, D.C.
Space Foundation to Host Colorado New Generation Networking Event - "Martians and Margaritas"
The Chicago Artists Coalition is delighted to announce the third edition of The ANNUAL (September 8 - 28, 2017) with the exhibition, The Shortest Distance Between Two Points curated by Caroline Picard with work by Candida Alvarez, Jorge Mendez Blake, Robert Burnier, Julietta Cheung, Assaf Evron, Roberto Harrison, Dominika Jackuliakova, Betsy Odom, Stephen Lapthisophon, Nazafarin Lotfi, Heather Mekkelson, Michael Milano, Bailey Romaine, Josh Rios + Anthony Romero, Ellen Rothenberg, Selina Trepp, Anne Wilson, and Fo Wilson. Euclidean Geometry is based on the precept that the shortest distance between two points is a straight line. An elegant and comprehensive geometry unfolds with that supposition in mind, a geometry whose logic yields other shapes and relationships, surfacing by way of conclusion in material architectures, cities, and regulatory bureaucracies that society navigates daily as a matter of course. Implicit in this inherited approach, however, is the premise that space itself is stable, flat, and consistent. What if we propose that space itself is curved? For a plane crossing from one part of the world to another, for instance, the arc is its most direct route. If space bends, an entirely other logic presents itself, realizing an alternate field of potential. "The Shortest Distance Between Two Points" explores the relationship between logic, geometry, and the social actions that unfold, react, or resist therein. Events and programming that will accompany the exhibition include an Opening Reception on Friday, September 8, 7-9pm, a Curators Tour (TBD), and The ANNUAL Breakfast on Friday September 15, 9-11am. The exhibition and all affiliated events will take place at the Chicago Artists Coalition, located at 217 N. Carpenter St. (free and open to the public). The ANNUAL is supported in part by The ANNUAL Council, a diverse group of professionals committed to helping visual artists thrive in Chicago. 2017 Annual Council Members: Ian Gray, Joshua Herrington, Shannon Downe, Robin Gallardi, Ashley Galloway, Browne Goodwin, Susan Lyons, Tommy Miller, Kathleen Rapp, Hunt Tackbary, and Christine Tsuchida. For more information about The ANNUAL Council, please click HERE. The ANNUAL, launched in 2015, is a yearly sales exhibition celebrating cutting-edge Chicago-based artists. Arranged by a guest curator, The ANNUAL creates an accessible forum for emerging collectors to discover affordable new work and engage directly with its creators. This year The ANNUAL will run for three weeks on either end of EXPO Chicago, opening Friday, September 8 and closing on Thursday, September 28. Hours: M-F 9-5pm, Saturday 12-6pm. Music Biz 2017 drew our biggest audience since 2001 ... with 2,000 attendees. It was also our higest rated event ever, with the majority labeling it as "Excellent." 96% felt attendance was worth the investment of time and money. 96% gave our programming top ratings. 95% said meeting and networking opportunities benefited their businesses or careers. 95% said that they planned to attend Music Biz 2018. 94% would recommend attendance to a colleague or friend. So, of course, we are heading back to Nashville for 2018. Mark your calendar and spread the word that Music Biz 2018 will be the year’s must-attend conference. CLICK HERE FOR A MUSIC BIZ 2017 RECAP! "Chicago Detours Shares Forgotten Patriotic Story About 1893 World's Fair"
In honor of the Fourth of July, Chicago Detours is pleased to share a forgotten story of American patriotism. Many know the event and love the song, but few remember that the famed 1893 World's Columbian Exposition in Chicago played a key role in the writing of "America the Beautiful." The full story can be found on the Chicago Detours History and Architecture Blog. The lyrics to "America the Beautiful" were first published as a poem in 1895. It was written by Katharine Lee Bates, a 33-year-old teacher from small-town Massachusetts. She was inspired by the beauty of the country and its ideals, which she experienced firsthand during a train trip from Massachusetts to Colorado. During that trip, she stopped to experience the 1893 World’s Columbian Exposition here in Chicago. Chicago makes its appearance in the later stanzas of the song. Bates was referring to the so-called "White City." That's the nickname for the spectacular artificial city that served as the grounds of the 1893 World’s Fair. The name came from the massive buildings, which had been spray-painted a gleaming white just days before the fairgrounds opened. Today, many may know the name from the popular non-fiction book The Devil in the White City. 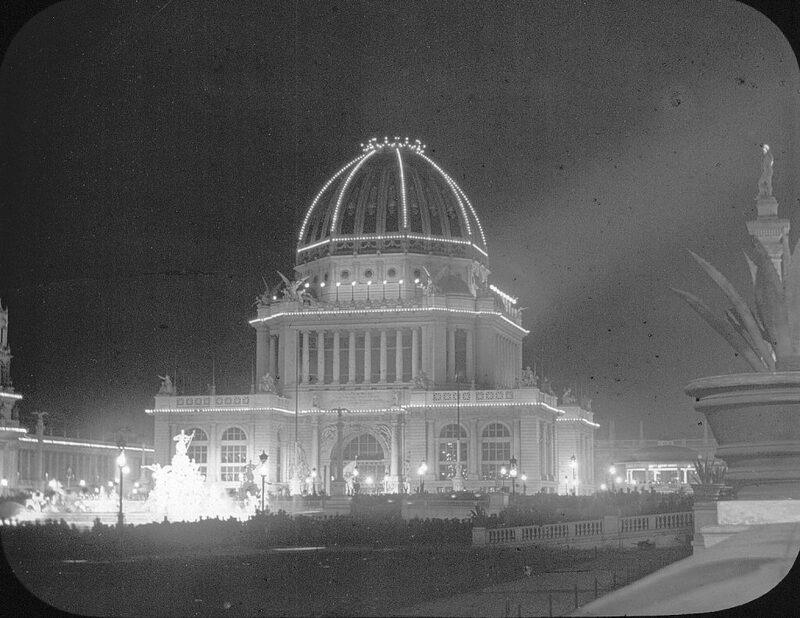 The White City nickname was also helped along by the glorious electric illumination of the fair. Powered by Nikola Tesla's alternating current electricity, the central Court of Honor was lit by thousands of incandescent lightbulbs. The sight of the Court of Honor was said to move grown men and women to tears at first sight. Bates herself paid tribute to it in a poem she wrote on the spot. 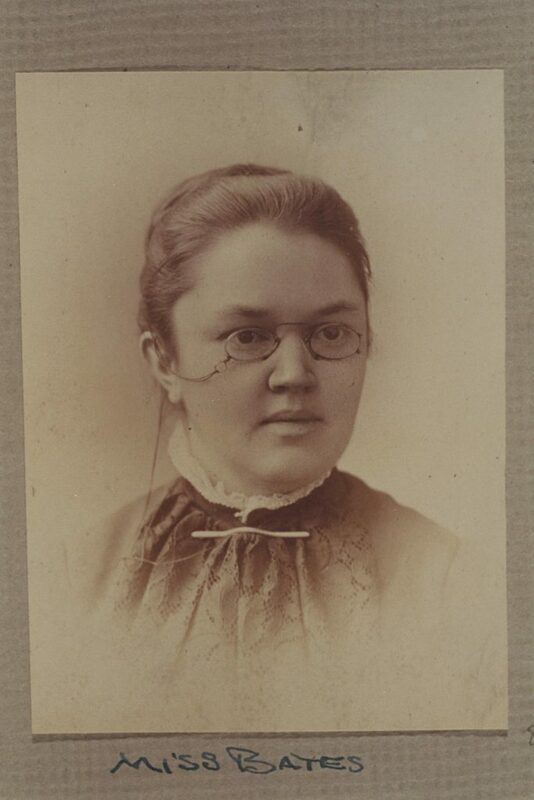 In her diary, she described the fair as simple "a thing of beauty." It's impossible to imagine how dazzling it must have been for a professor from Wellesley, MA. It gave people incredible pride to be American. 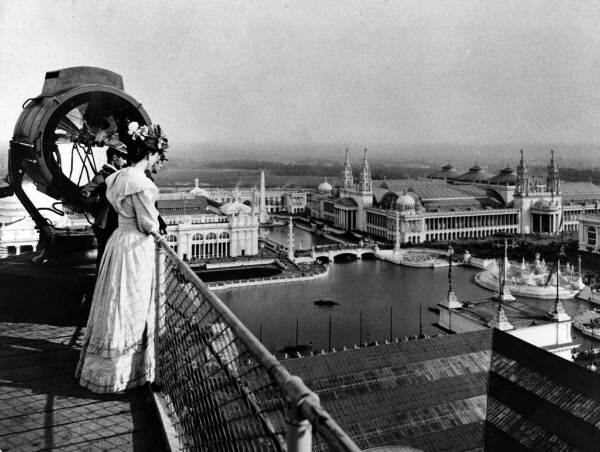 The 1893 World’s Columbian Exposition was shaping the American imagination before it even opened. It was named in honor of the 400th anniversary of Christopher Columbus's first voyage across the Atlantic. To celebrate that date and the imminent fair, a wave of patriotism swept the country. The Pledge of Allegiance that we use today was written in 1892 to coincide with the fair's "Dedication Day" that autumn. The fair itself was intended to be a patriotic demonstration of American freedoms and industrial might. All of this was swirling in Bates' head during her journey in 1893. Her poem endeavored to capture the country in all its beauteous glory in the summer where the United States seemed to make the leap into modernity. It took her two years to publish the poem, but it quickly caught on with the public. The music came later, when it was paired with a hymn by the composer Samuel Ward in 1910. The rest, as they say, is history. This old-fashioned poetic embellishment of the spectacular White City may not be sung aloud very often, but its presence is telling. Chicago in 1893, like most cities of its day, was a rough and tumble place. Most Americans in 2017 would find it shockingly dirty, violent, and poor. Yet the White City was designed specifically to be an idealized utopian vision of the American city. This alabaster city was a fake, of course. But it served as a model for what a country filled with patriotic zeal and boundless confidence could accomplish. In that, the White City was both a reflection and inspiration for the country itself. Chicago Detours discovered these connections while doing research for our 1893 World’s Fair Tour with Bars. This three-hour-long walking tour delves into the fair's cultural and architectural impact on Chicago history. "America the Beautiful" is used to introduce the patriotic tenor of the age, while also providing material for an ice-breaker. From there, the tour visits historic buildings that connect with the World's Fair. In fact, there are more buildings left in downtown from the time of the fair than on the South Side, where the fair was held. The tour is offered to the public three days a week: Wednesday at 5:45pm, Friday at 1pm, and Saturday at 4:30pm. Guests enjoy drinks, play educational games, and learn all the other unexpected connections and surprises we uncovered. 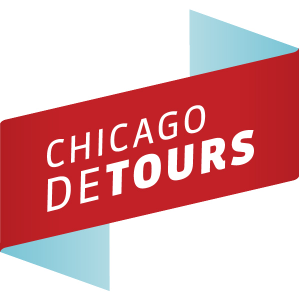 Tour tickets can be reserved online, at www.chicagodetours.com.